Orchard Fresh - CMI — Blind Renaissance, Inc.
Quality seals icons were created with texture that allowed a burnt wood treatment to be applied to packaging for a unique look. 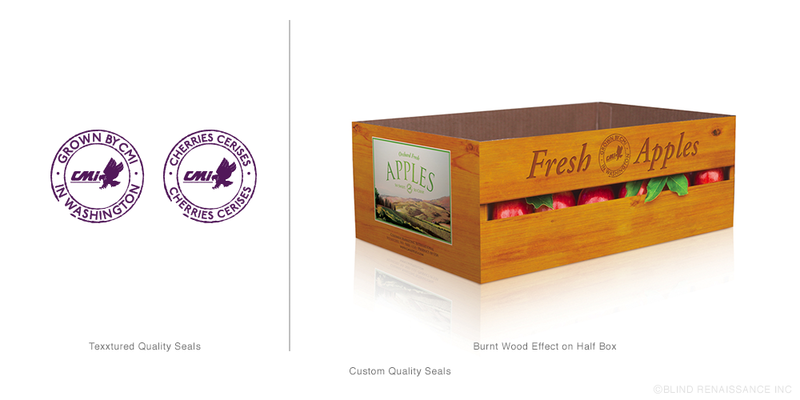 BR built a custom apple box that was photographed and applied to packaging to make closed boxes look like they were carrying fruit. BR created a custom dieline for a point of purchase display based on an antique handtruck used in the orchards. Custom POP display assembled to hold two euro trays. The wood apple box look continue to collateral materials such as a flyer and sweet-tart cards. Kraft tote bags designed as takeaways for customers. Preliminary ideas for sweet-tart thermometer design used on apple bin sleeves. 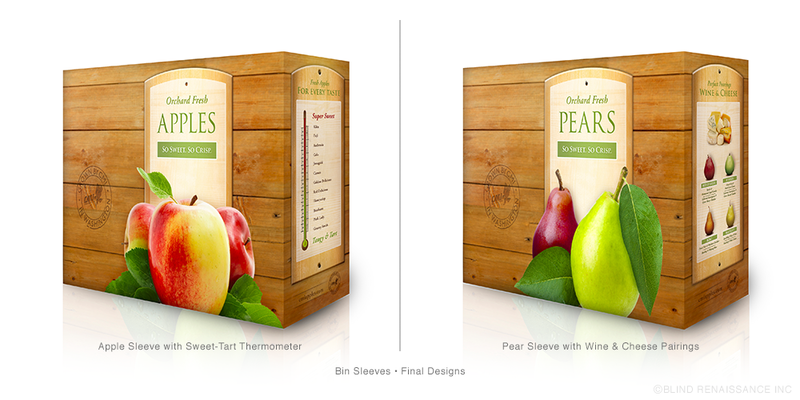 Final designs for apple and pear bin sleeves with a sweet-tart meter (left) and wine and cheese pairing (right). Continuation of wood theme used on cherry clamshell labels. 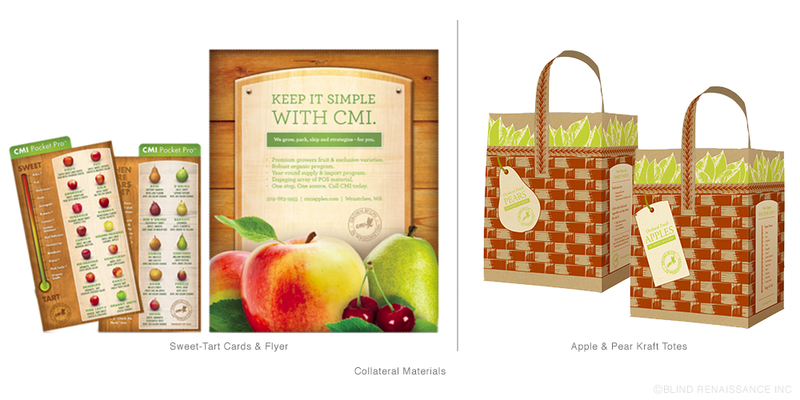 BR created a new look for Columbia Marketing International, Inc. for which they received nationwide recognition, top honors and a Produce Marketing Excellence Award for their new Orchard Fresh marketing materials. CMI is one of Washington State's largest produce growers, packers, and shippers and are dedicated to distributing the highest quality produce as well as providing award-winning POS materials. Wood panels and crates conjure up feelings of harvest bounty. 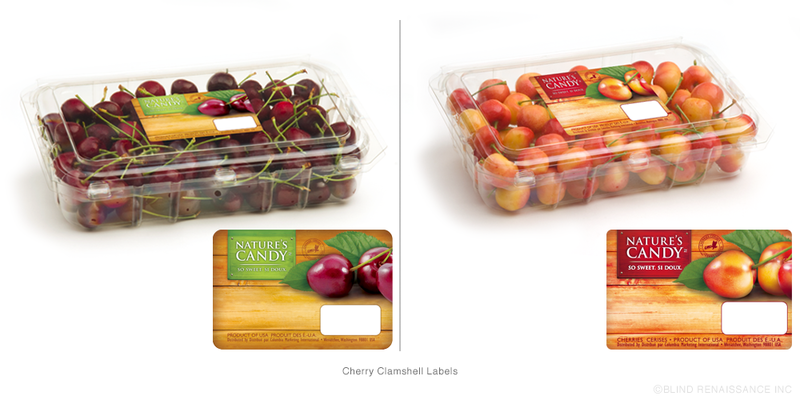 Consumers take away kraft bags of fruit featuring a rustic basket weave and decorative printed hang tags. 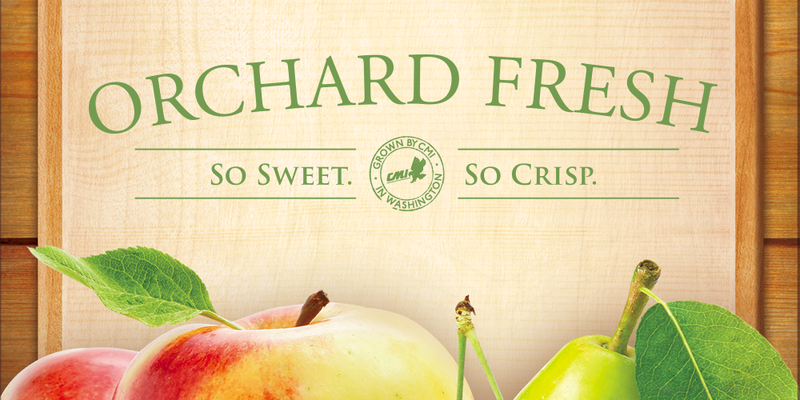 The Orchard-Fresh look was developed into effective trade advertising and reference tools for produce department staff.